Our Whitefish Meal and Salmon Meal recipe is advanced, grain-free nutrition for cats who deserve only the best. Sourced from trusted, passionate farmers, our premium ingredients provide all the vitamins, protein and antioxidants your cat needs to thrive. A great source of high-quality protein that contains more protein than fresh whitefish. Whitefish meal is a delicious and highly digestible protein that helps your cat maintain strong muscles. A naturally rich source of protein and Omega-3 fatty acids to help maintain your cat’s healthy skin and shiny coat. Whitefish Meal & Salmon Meal Recipe Cat Food is rated 4.2 out of 5 by 24. Rated 5 out of 5 by Nala from My car loves it and she stopped vomiting I bought this food for the first time because I ran out of my cat's food and couldn't make it to the pet store, so I went to the market and got it ...and I am so glad I did.... I have had my Siamese cat for 2 1/2 years .... She is a rescue and since the first day she came home she would vomit a few times every day... I had tried different foods... Changed her feeding times .... Nothing worked. After I started feeding her your food she stopped vomiting.... I cant even believe it. Thank you so much. Rated 5 out of 5 by MsPoppins from I'll never buy anything else again! I have tried every brand on the market and couldn't get any of my cat's to stop puking up the food. Last try was Supreme Source and a miracle happened. My cat's LOVE the food and they aren't throwing up every time they eat. Their coats are back to beautiful and they are happy kitties once again. I will never buy another brand again and I really don't think they'd let me. Rated 5 out of 5 by purplerose22603 from I love this food! This is food is great for both my dog and two cats. It is made with wholesome ingredients that my pets love. I just wish that the cat food came in larger bags because I always have to buy two bags at a time and only for two cats. The tiny bag just isn't cutting it. Rated 5 out of 5 by Felipe from Best cat food ever I have cats who will eat anything, but one of them used to puke at least once a day. I tried so many foods in every price range, and this has been the only one that he doesn't puke, so I'm thrilled with it. The only store where I've found it is 10 miles away, but it's worth the trip to prevent the puking. Rated 5 out of 5 by TLStudent216 from Best Dry Cat Food My "kids" (cats) love this dry food. Not only do they prefer this brand, but this is the only brand that does not make them sick. We all have heard cats throw up furballs, well since mine have been eating Supreme Source, no more furballs.. Rated 1 out of 5 by Pammie from My rescue kitty, Gracie, would not eat it! My Gracie smelled it, actually looked @ me as if to say.....what else do you have for me? I don't like this! And she walked away. I also bougt her the soft salmon treats, she would have no part of it! Again, smelled it and walked away. Rated 5 out of 5 by sukee from My pet, Stetson, Loves Grain Free Biscuits I have been buying these biscuits for approximately 2 months. My dog, Stetson, is on a completely grain free diet. These bones are healthy, grainfree and tasty..... Not to mention that I can conveniently purchase them in my local grocery store. Good Job! KITTENS: Kittens generally nibble solid foods at three to four weeks of age. 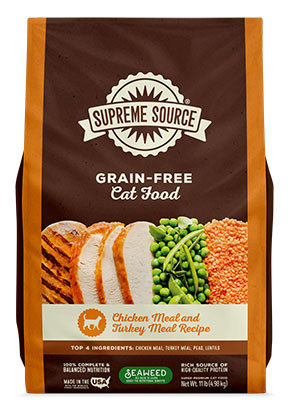 Keep moistened Supreme Source® Whitefish Meal and Salmon Meal Recipe Cat Food available at all times. After weaning at six to eight weeks, kittens will normally eat dry or moistened food at will. PREGNANT OR NURSING FEMALES: Supreme Source® Whitefish Meal and Salmon Meal Recipe Cat Food is a complete formula, providing extra nutrition for females in stages of gestation and lactation. Food intake make double or even quadruple during lactation. Whitefish Meal, Salmon Meal, Peas, Chickpeas, Poultry Fat (Preserved with Mixed Tocopherols), Turkey Meal, Potatoes, Dried Egg Product, Natural Flavor, Ground Flaxseed, Sodium Bisulfate, Calcium Carbonate, Dried Chicory Root, Organic Dried Seaweed Meal (Ascophyllum nodosum), Choline Chloride, Betaine, Vitamin E Supplement, Taurine, Zinc Proteinate, Carrots, Blueberries, Cranberries, Spinach, Parsley, Pomegranates, Zinc Oxide, Ferrous Sulfate, Niacin Supplement, L-Ascorbyl-2-Polyphosphate (Source of Vitamin C), Manganous Oxide, Manganese Proteinate, Vitamin A Supplement, Copper Sulfate, d-Calcium Pantothenate, Thiamine Mononitrate, Sodium Selenite, Riboflavin Supplement, Copper Proteinate, Pyridoxine Hydrochloride, Calcium Iodate, Vitamin D3 Supplement, Folic Acid, Cobalt Carbonate, Inositol, Biotin, Menadione Sodium Bisulfite Complex (Source of Vitamin K Activity), Vitamin B12 Supplement, Rosemary Extract. 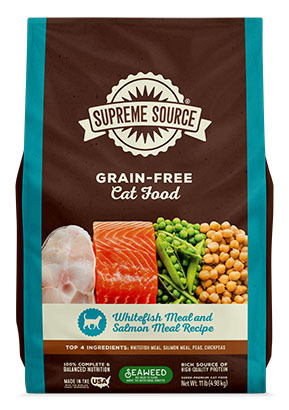 Supreme Source® Whitefish Meal and Salmon Meal Recipe Cat Food is formulated to meet the nutritional levels established by the AAFCO cat food nutrient profiles for all life stages. Omega-6 Fatty Acids* 2.1% Min. CALCULATED CALORIE CONTENT (ME): 3,660 kcal/kg., 395 kcal/cup.